Being the wife of one of the most respected and feared men in the city comes with an array of perks and Diamond enjoys them all. From designer tags, fast cars and trips to foreign lands, Diamond lives a life that most women only dream of. For Diamond, however, dreaming and wishing is not her forte but when she does, it's a guarantee that her husband, Leon "Gator" Douglass, will make all of her dreams and wishes come true. When the good life goes sour and Gator lands himself in prison, Diamond quickly discovers how fast one can go from eating Caviar on Wednesday to Beanie Weenies on Thursday. Determined to survive on her own, and keep the empire Gator once built, Diamond assumes her rightful place as the leader of "the family." When friends become enemies and enemies become allies, Diamond learns loyalty could possibly be the most expensive gift her husband ever purchased and one that she may not be able to afford. Tricia: Tell us about your latest book. MZ: My next release is Diamond. 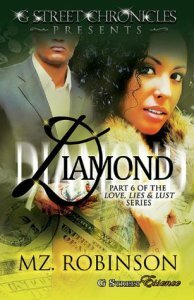 Diamond is book 6 in my Love, Lies, and Lust series and introduces my readers to Diamond Douglass, the wife of a king pin, Leon “Gator” Douglass who was introduced in book 4 of the series. Leon’s reign comes to an end when he is thrown in prison, leaving Diamond to fend for herself and provide for the ones they love. It’s throughout this journey that Diamond discovers who she really is and the truth behind the man she married. Diamond takes my readers on an emotional rollercoaster full of twists and turns, that all lead up to a breathtaking ending. Tricia: What marketing methods are you using to promote your book? MZ: I’m using a lot of virtual-blog tours, traditional print ads, meet and greets, and flyers. Tricia: What formats is the book available in? MZ: The book will be available in e-book format as well as paperback. Tricia: What do you like to do when you're not writing? MZ: I like to think about what I’m going to write next. (smiles) I also enjoy shopping, singing, and reading. Tricia: Who are your favorite authors? MZ: Some of my favorites are: Terry McMillian, Zane, and Stephen King. There are also several independent authors that I love and enjoy their work. Tricia: What advice do you have for other writers? MZ: My advice is to study the ends and out of the business, perfect your craft, and create your own lane. Tricia: What's your favorite quote about writing/for writers? Tricia: What's the best thing about being a writer? MZ: The best thing about being a writer is the readers. When I hear how much they enjoyed one of my books or how they’re waiting for the next one, it makes the long-sleepless nights worth it. They’re support is truly a blessing. Tricia: Where can people find out more about you and your writing? They can find me online at MZRobinson.com, Facebook: Mz Robinson, Twitter: @AuthorMzR, and follow my blog: mzrobinsonwrites.com.